Hi Beach Lovers! Book by 5/15/19 and save $100 off weekly rate, to help you off set the new tax law. A unique place, our 'Nauset Teepee' promises you a memorable family holiday in a clean, quiet setting that is distinctively Cape Cod. 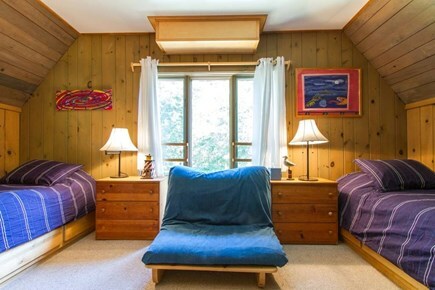 The floorplan offers a first-floor bedroom with a king size bed and full bath, large common room with walls of windows bringing the beautiful woodsy outdoors right inside. 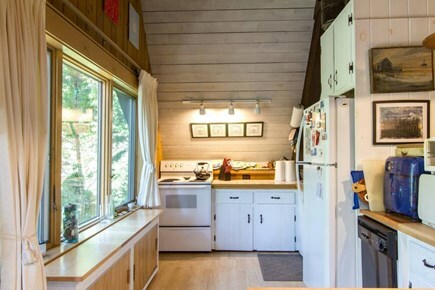 The open kitchen area has a standard stove, large refrigerator, dishwasher and sink with plenty of counter space for preparing meals. There is also an outdoor gas grille and picnic table. Up the spiral stairs to the second floor, you'll discover two large bedrooms, one with a set of twin beds ( plus 3rd bed is a thick futon mattress on a frame that folds out) and in the other bedroom, a Queen. 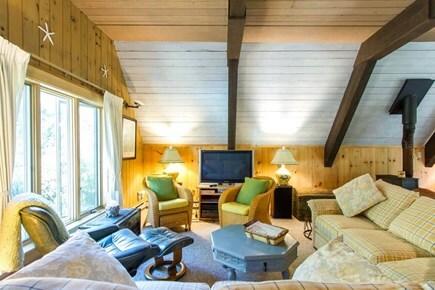 Both bedrooms have high ceilings, tall windows and wonderful views of the private grounds. 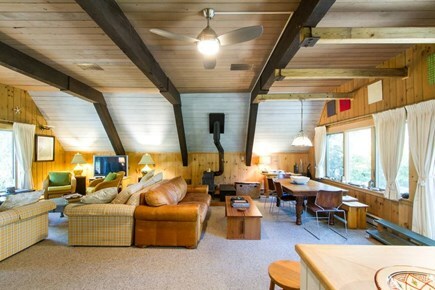 The totally naturalized setting of this special house will appeal to those who seek comfort in the beauty of the woods. The trees here teem with bird life, and this secluded sandy lane provides a pleasant stroll, or jog past other country homes. Just minutes away by bike or car are the bay and ocean beaches. Additional availability info: You may contact me for shorter stays off season pending cleaning availability. This is a Saturday to Saturday vacation rental. Additional pricing info: $180 cleaning fee includes includes linens, State and local taxes of 12.45% will apply. So glad you enjoyed the area and that the house had everything you needed! We aim to please! And we love having you back year after year. Just so folks know, we are off of Herringbrook, closer to the Bay, a good distance from Rt. 6, so the occasional passing car is never going to be Rt.6 traffic noise, :) nor will you see any cars passing by because of tree-lined "fences". 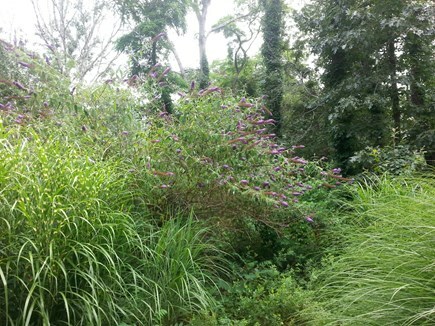 We have excellent local folks taking care of the grounds, trash removal, and cleaning. All you have to do is come and enjoy this very special spot on The Cape! See you soon! We were so lucky to sleep on the second floor with a balcony overlooking a wooded area full of birds. The house is so private and cozy and yet both the bay and the ocean are minutes away. As well as excellent food with a Cape Code atmosphere. 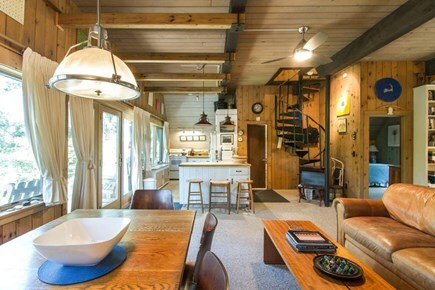 The house has the perfect vacation layout with lots of room-- indoors and out. Thank you-- when can we come back?Recommended for: Families with Young Children, Sightseeing, Girls Getaway, Tourists without a Car, Adventure Seekers, Age 55+, Romantic Getaway, Families with Teenagers. Cool! It was sorta like sleeping in the forest canopy, right? Only better because you are in a comfy Queen sized bed with a glass door ( or screen slider if you choose to leave the door that leads out to the balcony open) and a bathroom just steps away in the hall. The sun sets on that side of the house so you get the colorful evening sky. 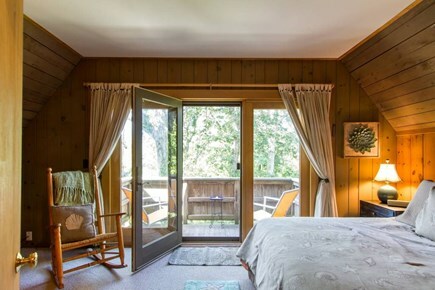 Next time you could check out the Master, with the King bed, on the other side of the house where the sun rises if you like to be up with the sun :) There's plenty of room for everyone to spread out and relax, read, nap and then come together for meals and games. Great restaurants nearby and of course, some of Cape Cod's most brilliant beaches. Check the calendar and book your next visit! You're welcome anytime. We had a peaceful, relaxing vacation at the Nauset teepee. 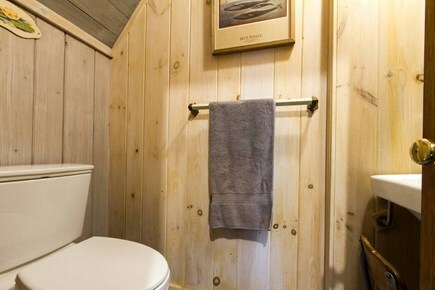 The cottage is clean, well maintained and secluded. Jeanne was very helpful and attentive. 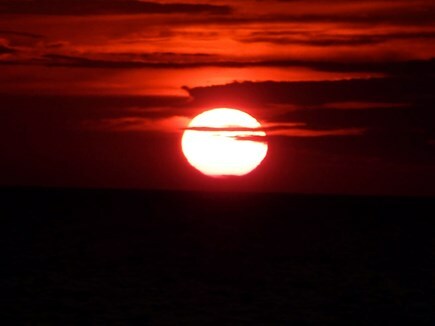 We were close to everything and enjoyed exploring the national seashore, area restaurants, whale watching from Provincetown and just lounging around the cottage. I'm pleased to hear that you found the cottage clean, well maintained and while secluded and peaceful, close to some of the very best destinations on the Cape. Lovely restaurants and National Seashore as well as biking, paddle boarding, kayaking and shopping nearby as well. Hanging at the cottage! Wonderful. You are welcome back anytime :). Unique property on a quiet lane. 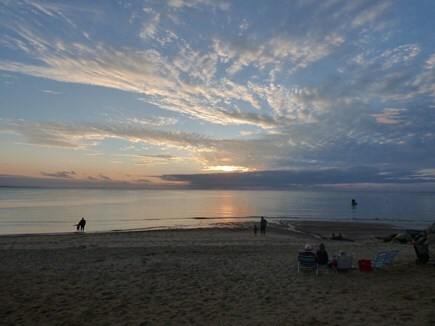 Everything you need for a peaceful, relaxing vacation near all of Eastham's beautiful beaches. 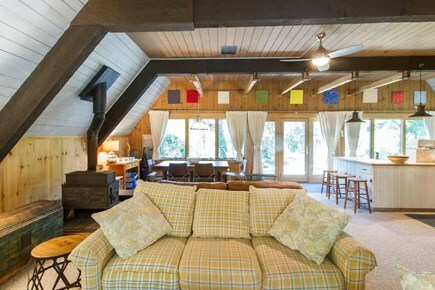 The Nauset Tee Pee House is a wonderful retreat! Peace and quiet surrounded by nature. 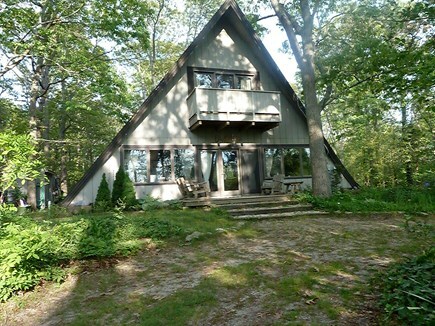 Nauset Teepee is located centrally on beautiful Cape Cod. Beach is minutes away. Tranquility beauty and adventure out your door. GREAT place to relax AND enjoy! 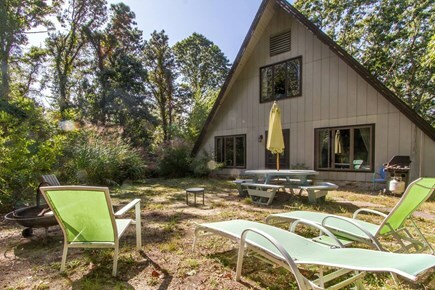 The house is ideally located...nestled within the trees provides privacy and a peaceful atmosphere. 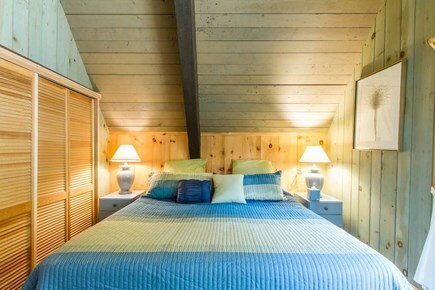 The house is comfortable and beautifully furnished in a most welcoming way! It is close to the beach and bay. I particularly LOVED kayaking through the salt marshes! People in the area are super nice! This was our 2nd time going to this house and look forward to going back again!!!!! Although we grew up in the 'City' and now live in the Hudson Valley farm country, we LOVE the beach. In our early days of marriage, pre-kids, we'd visit antique shops on the weekends. One time we found an antique CRAB door knocker and joked that we'd build a beach house for it someday. When the opportunity came to buy this house, we did, and gave the CRAB a home :) Our children feel that Cape Cod is just as much home as where we live most of the time. They are well versed in fishing, crabbing, boating, whales, turtles, and TIDES...a world very different from the pastures here in NY state. Because it is our second home, you will not feel like it is a rental. We take pride in making it feel like home. As a matter of fact, our House was featured on HGTV's National Open House in August 2007. We can't imagine life without our Cape Cod Teepee. 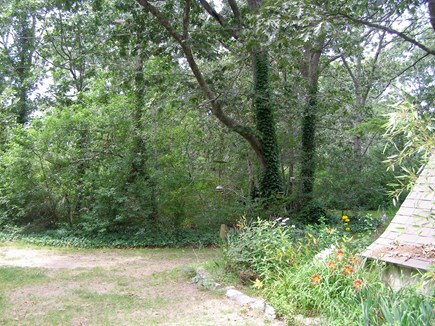 Our property is private...We sit on a 'Cape Cod acre.' It's quiet, woodsy location is down a sandy/grassy lane. ( No Rt. 6 traffic noise) There are other homes nearby, yet you have a sense of privacy without feeling isolated. I love to garden so there are plantings all over and the deck and upstairs balcony offer nice venues to enjoy the outdoors in comfort. 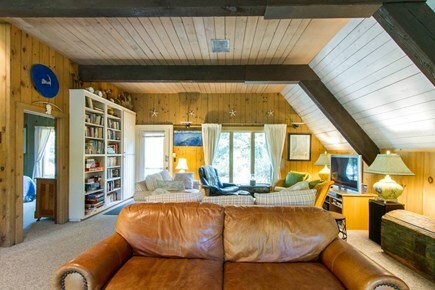 The house has an open loft-like main floor. The ceilings are high and the glass ''walls of windows'' allow one to bring the outdoors, indoors. The bay is a short walk ( .78 mi ) away and the bike trail, restaurants, etc are easy to access. I love to cook, so the kitchen has lobster pots, spices stocked, everything the cook needs to prepare meals if you choose. Children are always welcome and they enjoy the spiral staircase as much as the safe play area all around the house. The kids will be safe so parents can relax. The backyard is a large open area and there is a private Hot/cold shower room there with a lovely beachy garden for dining and BBQ. Eastham is convenient to so much of what the Cape has to offer. It is one of the narrowest towns on the Cape ( so water is always close by) and is smack dab in the ''middle'' of the Cape- so points East and West, North and south- all open for exploration :) should you wish to! 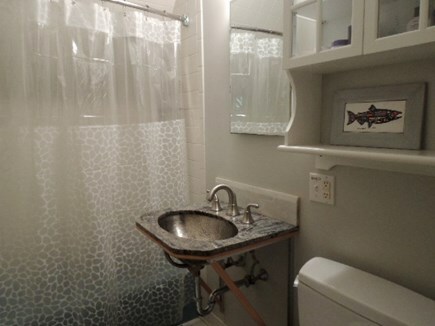 Our house is a short walk to the bay (10 min) and a short drive to the ocean (6 min) There is a large freshwater swimming pond (Wiley Park), with lifeguards, within walking distance of the house as well. Eastham is home to the famed National Seashore Beach- Coast Guard Beach- and a five-minute drive to the Audubon Wildlife Sanctuary. Close by are all the places mentioned in the description and it is also the first town on the Cape that my husband and I visited together. After months of searching, we found this unique house in a rare, beautiful setting. We like its less manicured, woodsy feel.